The current price of $14.95 represents any movements in the silver market within the last 15 minutes. 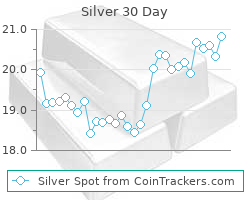 We have been charting the silver spot price reliably for over 2 years now, so bookmark this page and tell your friends. If you want to can even grab the code below and display the chart on your own site or social networking page. Silver is a metal slightly harder than gold, and used for many of the same purposes. When used in coins it is typically used for anything from dimes to dollars. Anything from .10 to $1.00 can be easily created using combinations of nickel, copper and silver. Did you know that the $1.00 Silver Eagle is worth $14.95 as it contains 1 troy oz. of silver? Silver has also historically been used as jewelry and medicinally for it's antiseptic properties, and is currently being used in almost every electronic device on the market as well. Silver Values-Shows Troy, Sterling, and Coin prices. Silver Coin Calculator-This calculator will quickly give you the silver value of your coins.